It seems like only yesterday that I did my last post... but according to the date on it, it was in fact AGES ago. So what have I been up to? I bought some bamboo batting for the first time, and decided that this would be the great hand quilting experiment...relatively simple large stitches outlining the shapes. 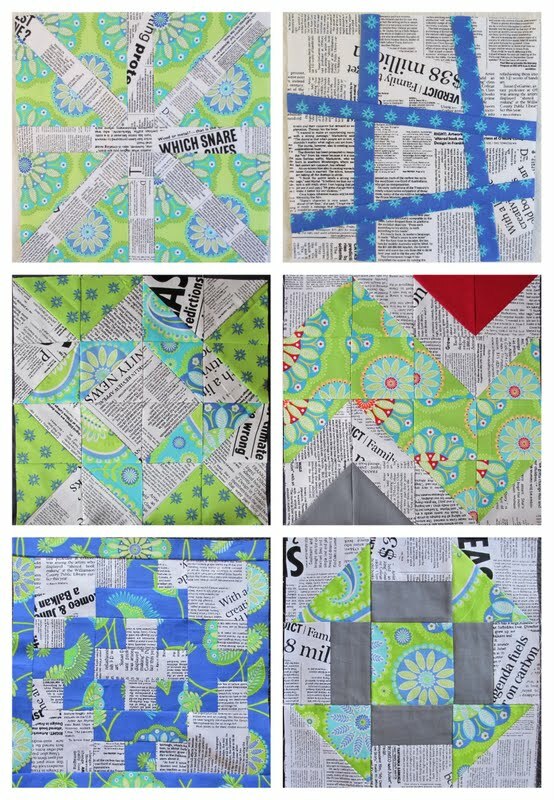 Also on the sewing radar is The Jelly Roll Sampler. The plan includes some basket blocks which have a background fabric. With the setting I have chosen, I needed to decide whether the block background was going to be the same as the setting background... yada yada, more decisions indecision. I bought a really pretty duckegg solid, but it just wasn't quite doing it for me. If in doubt, go and discuss it with your best friend - Monika saved the day and after lots of discussing all sorts of topics, suggested a scrappy low volume background. Perfect, I had already started a bundle for February new project number two and three. While I've been cutting these bits, I've multitasked and cut out the starting stages of those abovementioned new projects. I'm loving this new project thing... next year will probably be the year of the unfinished. You will also have noticed by now that I tend to do several projects that use a similar theme, whether it be fabric or design. I've put together a few quilts lately with a large nine patch layout, I'm concentrating on several sampler style quilts, I've used the black and white text fabric in several projects, as well as the light grey homespun. Now is the time for the rest of the Denyse Schmidt fabric (left over from the dresden fan wedges) plus a few more which caught my eye, in combination with the rest of the low volume bundle. OK, I've put multitasking onto a whole new level - also a whole new level of mess. New February Project Number Three - Plus and Cross quilt. This will be a lot more chaotic scrappy as each corner is a different fabric. Results in interesting secondary patterns in the final layout. And I've finished the LAST SWOON BLOCK! I think this deserves it's own post... so I'll come back to it later in the week. Well, I suppose I have had quite a busy couple of weeks haven't I? And NO, I didn't make any further progress on the borders for Bluebirds and Berries BOM (although I did buy some more fusible web on Tuesday). Remember for next month - chose a goal that is achievable! Can you believe this is my 200th post? And I'm partly through Block 9 - the last block. Woohoo!! Almost time to start thinking about the quilting stage. Although as I have now used up all my fusible web (with only one border piece partially constructed), I'm not sure how exactly I'm going to finish my goal - I may have bitten off more than I can chew! I've really been enjoying the new projects I started in January, and while I know I can't keep starting projects like that every month, I have been tempted already to start a new project for February. It all started when I read about Elvy Crafts jelly roll sampler quilt blocks. Click here to see her progress so far. After trawling through her delicious posts, I realised I had the book she was using for her patterns, in fact, I've had it for quite some time, and it hadn't inspired me at all. That soon changed once I pulled out the jelly roll mum bought me from England, decided on which blocks I liked, had a play on EQ6 for some setting ideas... and I've now finished three whole blocks. Tuesday is the day I work half a day... to fill in the rest of the day sometimes I do housework and catch up on the washing... other days I disappear into The Sewing Shed! I've also spent a bit of time putting together the first block in the first new project for February. 2013 must be the year of the sampler quilt. More details to come. And can anybody guess what this is? Does this one help any? I've been thinking about what my February goal would be from the time I finished January's goal. I could just put down another swoon block - well, it worked last time - but I feel like Swoon has gained momentum again, and hopefully I can get the rest of the blocks completed without having to make it an "official" goal. So I'm thinking maybe of choosing the Gail Pan Bluebirds and Berries BOM with the specific goal of designing and completing the finishing borders. The original pattern has a narrow plain border, then a wider plain border. I plan on something "bigger" and a bit more me. I've cut a few 2" squares... I've got a narrow border cut... watch this space! The projects started last month have been calling to me so I couldn't wait until the start of February to begin the next lot of blocks. The Chunky Chevron block... I really like this one - and it's pretty close to being the right size! First one so far... woohoo! I am trying to complete blocks using the techniques described in the instructions. Each of these blocks used different "quick" techniques to create the half square triangles. Not sure whether I am sold on either technique, but I've done them, and that's the main thing... and a bit of a collage of progress so far. I've also laid out Block Two for the Tokyo Subway quilt. This month we're doing block 2 and 15 which meant adding orange into the mix. By selecting blocks with minimal extra colours, hopefully the cutting side of the whole project will be comfortably spread out through the project. If any one is keen to join in with this monthly project - the instructions for all the blocks are still on Oh Fransons! blog. I'm doing 2.5" cut squares (so I can maybe start a scrap vomit quilt with the leftovers). Go on, I know you want to! Last month we started with Blocks 1 and 5 (light blue, yellow, grey, red + background).